SACRAMENTO, Calif. (CN) – Fresh off an endorsement from President Donald Trump, Republican businessman John Cox is gaining ground on Democratic frontrunner Gavin Newsom in California’s gubernatorial race. 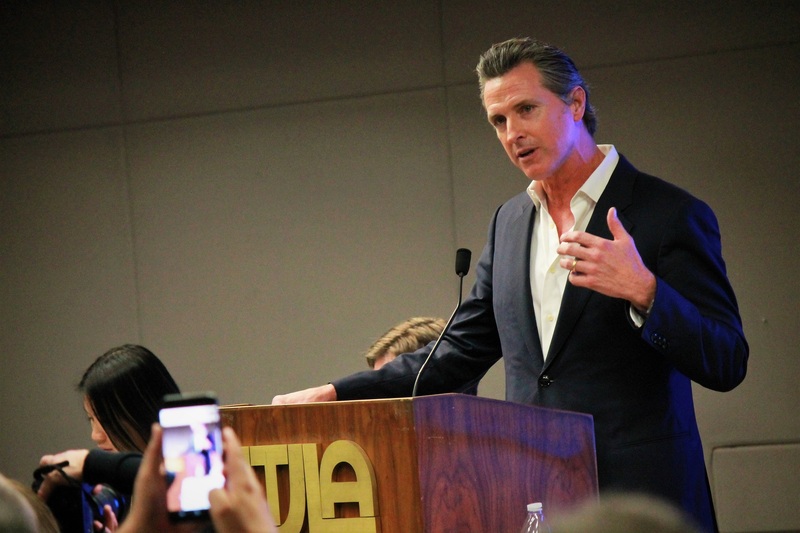 In the final statewide nonpartisan poll before the June 5 primary, 25 percent of respondents favor Newsom followed by 19 percent for Cox. 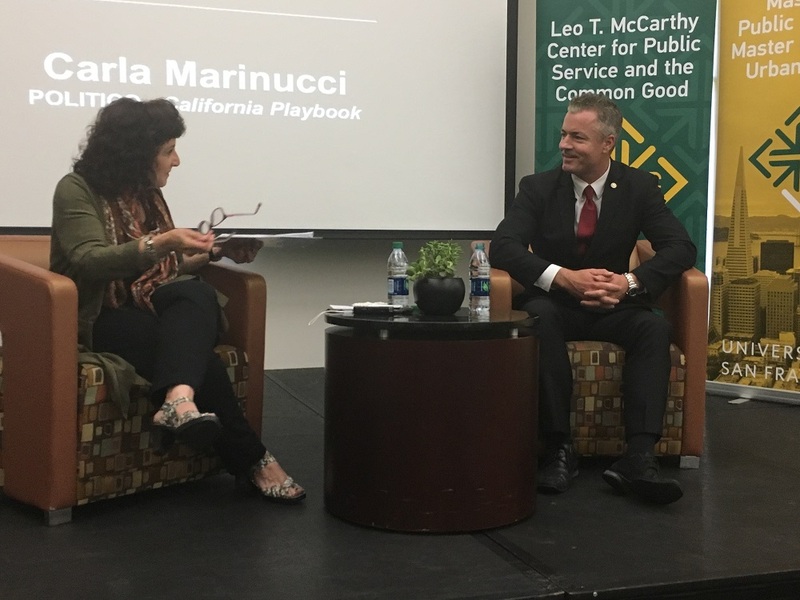 The Public Policy Institute of California survey has Cox slightly ahead of former Los Angeles mayor Antonio Villaraigosa, a Democrat, for the all-important second spot. While Newsom has been the top choice among likely voters for months, Cox jumped four points since April’s poll. Newsom held a double-digit lead over Cox in the previous polls. “Newsom’s support has been consistent across five PPIC surveys, while Cox’s support has sharply increased since our January survey,” the institute’s president and CEO Mark Baldassare said in a statement,. California conducts a top-two or “jungle primary” with only two candidates advancing to the November ballot, regardless of party affiliation. This will be the first election with an open governor’s seat since California switched to the top-two system in 2011. “California finally deserves a great Governor, one who understands borders, crime and lowering taxes. John Cox is the man – he’ll be the best Governor you’ve ever had,” Trump tweeted. Cox hopes Trump’s endorsement consolidates the Republican vote by swaying voters from Allen, who was fourth in the poll at 11 percent. Cox’s campaign manager Tim Rosales believes the endorsement will not only fend off Allen, it spells doom for Newsom. “With President Trump’s endorsement California Republicans clearly view John Cox as their candidate. Further, John Cox is running even with Gavin Newsom amongst independents despite millions in attack ads paid for by Democrat billionaires,” Rosales said in an email. The poll comes less than two weeks before the June midterm and with voters already sending in absentee ballots. A majority of votes were cast by mail in the last three November statewide elections, including 8.4 million absentee ballots in the 2016 presidential election. The May results were based on a telephone survey of 1,702 California adults and has a 3.1 percent margin of error. The institute targeted likely voters from five geographic regions and a variety of ethnicities. Immigration, the economy and housing continue to be the largest issues with likely voters. Using the Trump administration’s ongoing lawsuit against California’s sanctuary policies as background, the institute asked about voters’ immigration views. Democratic and independent respondents overwhelmingly said immigrants benefit the state while 55 percent of Republicans said they are a burden. But independents, Democrats and Republicans agreed there should be a process for undocumented immigrants to stay in the country legally. 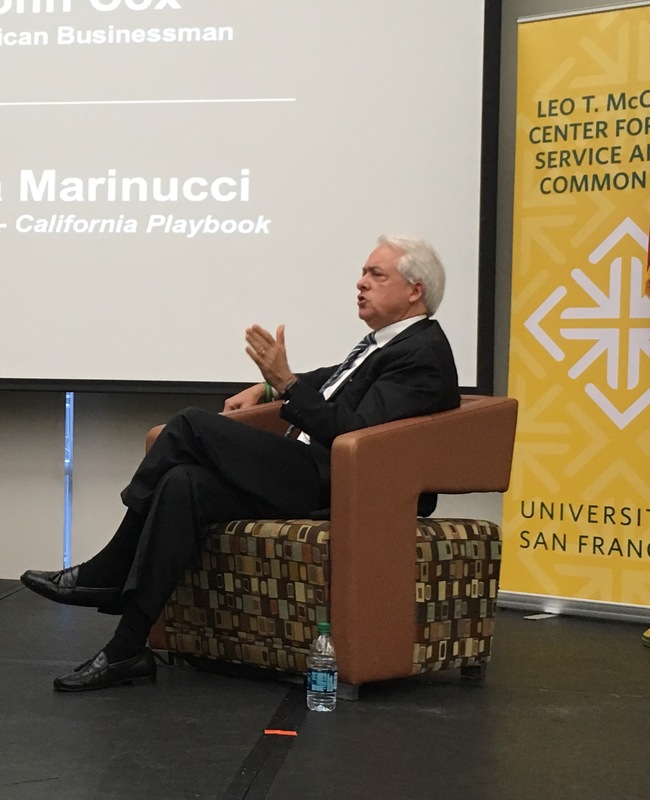 “Majorities across the state’s regions continue to view immigrants as a benefit, while local tensions have been surfacing about federal and state roles in immigration enforcement,” Baldassare said. 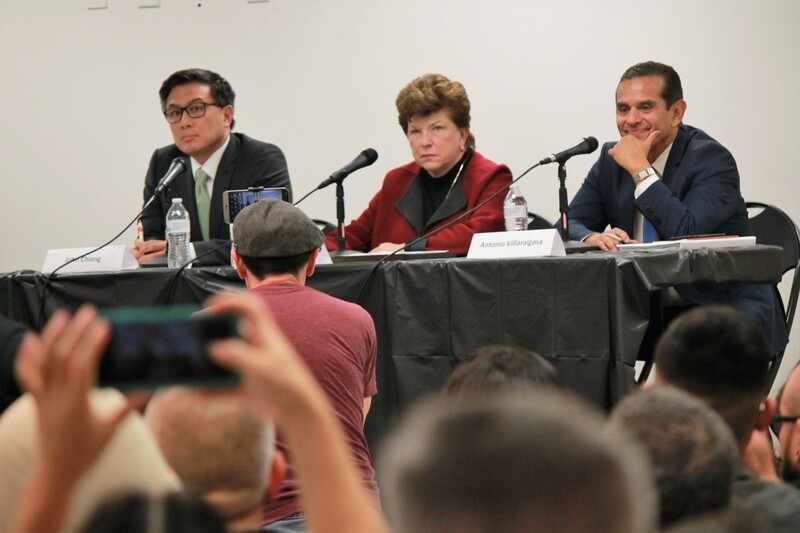 Democratic candidates in Los Angeles, from left to right, John Chiang, Delaine Eastin and Antonio Villaraigosa. Courthouse News photo by Nathan Solis. The wide-ranging poll also asked respondents about Trump, Russia and congressional races. The results indicate Trump’s endorsement of Cox may not hold much ground in a state that overwhelmingly voted for Hillary Clinton in 2016. Just 38 percent of likely voters approve of the way Trump is handling his first term, and 74 percent believe the Russian government tried to influence the 2016 election. But nearly half of agreed that the Russia investigation is politically motivated, including 79 percent of Republicans. If Democrats are to regain control of the U.S. House of Representatives this fall, the “blue wave” will have to reach California and make the Golden State bluer than it already is. With an unpopular president and Republicans making up just 25 percent of the state’s registered voters, Democrats are targeting seven GOP-held congressional seats. Just over half of likely voters polled said they would favor the Democratic congressional candidate if the November election was held today, and 46 percent said they are extremely or very enthusiastic about voting in congressional races. Partisanship remains strong, with Democratic candidates favored by a 32-point margin in Democratic-held congressional districts and Republican candidates preferred by 28 percent in GOP-held districts.